Sometimes runners get injured. Sometimes we're unable to run. And sometimes we get upset about it. Because there's nothing worse than wanting to run, and having your body say no. But I firmly believe that no injury is forever. Once a runner, always a runner - so with patience, introspection, and diligence, any runner can get back on their feet, back out on the roads, back out doing what they love. You all know I've had my issues. But nothing I've experienced can compare with a certain friend of mine. I won't list her problems, because dwelling on the bad doesn't help anyone. Let's just say that she's been through a lot, and dealt with it in various ways, ranging from angry tears to systematic treatment, to hours upon hours cross-training in the pool or on the bike. But this week, after many months of almost-recoveries, things finally went well. So this blog post is an Ode to Jess. I'm like a ridiculously proud parent right now! Seriously, imagine me as an crazy lady on the bus (probably wearing spandex...and maybe a fanny pack). And you are all the unsuspecting passengers. I pull out my pictures, a newspaper clipping, and commence subjugating you to a long detailed story. 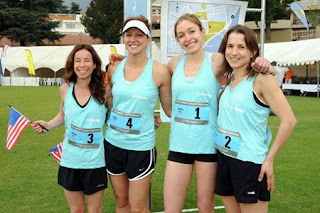 Last June, Jess ran in a Corporate Cup Race on her company's team. And won. Because she's that awesome. 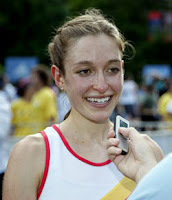 A few weeks later, I got a call: Oh my God, Mol, remember that race I did? Well Fidelity's team won, and now they're sending us to South Africa in March!!! So here we are in March, and about 4 injuries since her Boston win, Jess boarded a plane to Johannesburg, not exactly planning on racing. But her feet felt good, and it was too much of an "event" not to run. So she did. Like I said, I'm so proud of this girl! I know she works hard, and I know it hasn't been easy...so wow. Usually a blog is a platform to brag about oneself...but I can't compare with this one - Thus, my Ode to Jess. Go her!